Origami’s free performance opened London’s 2017 Dance Umbrella Festival and was subsequently performed in four other London locations. 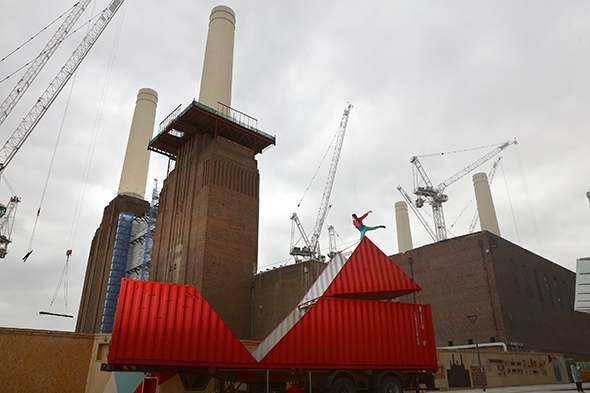 If we were to imagine the American artist Donald Judd dozing in his studio, he might have been dreaming of a bright red container on the Thames riverfront set against the profile and the silhouetted cranes of Battersea Power Station on a drizzly, misty evening. An audience gathers in front of the parked 40-foot container on the terrace in front of Circus West Village Piazza, which is the point at which Judd’s dream vies with reality. On a balcony just above and to the side of the container, as if they are sitting in a covered theatre box, residents from the block of flats have settled down to watch the spectacle. Dance Umbrella is turning open air spaces into theatres and bringing dance to new audiences. Origami is as much about the experience of watching it as it is about the performance itself. What Satchie Noro and Silvain Ohl have created is an awareness of both scale and contrast and as if the inherent contrast between a container and a solo dancer is not enough, the evening’s floodlit landscape of the refurbished power station rises like a monumental set behind them. Fred Costa’s sound score seems to arise from the same industrial, riverside setting and continues as a collage of music, speech and urban sounds that merge with the installation’s own mechanical rasp to wrap the visual reverie in a timeless and borderless aural space. Despite the sense of imposing gravitational force all around, the experience of watching the performance is somehow unearthly. Origami is generally thought of as the Japanese art of paper folding, but the development of the science and mathematics of origami has led to research where hard materials, oxyacetylene cuts and metal hinges replace the traditional paper and folds. What Ohl has conceived in slicing up his container is a rigid origami pattern which we see initially in profile as essentially flat, but when its inverted triangular section slowly winches open on its hinges we experience a three-dimensional origami flooded with light. The light in turn softens the industrial edges of the metal to prepare for the emergence of a human element. At first we see two elegantly pointed feet swimming languidly in the air but as the geometric space unfurls, we see the feet are joined to a female figure dressed in green trousers and layered blue and red tops suspended by her hips on a trapeze. The playful colours are reminiscent Robert Indiana’s LOVE sculpture, though Noro’s shades of blue and green are minute flecks of colour against the giant red surface. Noro’s childlike nonchalance and sense of adventure within this layered interaction of material and light, of mass and space, of small and industrially large is what gives Origami its dreamlike aspect. Her agile motion animates the space and plays with the juxtaposition of scale. At the top corner of the container close to the balcony she seems to be within reach of the spectators, drawing them into the action, and when all we can see is her hands gripping the top of a container wall she’s hiding behind, such a tiny detail is clearly recorded as an extension of her invisible form. Once the rigid origami begins to open, its two mobile sections continue to move, almost imperceptibly, until the end. Noro’s negotiation of both the material of the container and the spaces between its elements shares this elongation of time; she moves slowly and smoothly, an ability derived from her training in classical dance and circus arts. She is as comfortable hanging in space and from the steel ropes that connect the three sections as she is climbing on their exterior surfaces or sliding down their edges. She occasionally punctuates the arc of her movement with static poses like a classical sculpture in the pediment of the upturned triangle, or draping herself over its apex, drawing our attention to the architectural shapes and spaces that the origami pattern suggests. Just in front of the standing audience three children follow Noro’s every move with their eyes and bodies, daring each other to accomplish on the damp terrace what she is achieving up above. It is only at the end when Noro drops lightly from the trapeze to the floor of the container and disappears into the welcoming light of its interior that the children finally awake from their dreams of aerial adventure.